Aldeburgh is one of the most charming old seaside towns on the Suffolk coast, a haven of pretty streets lined with pastel coloured cottages, little galleries and boutiques and nice cafes and fish shops. There’s also a pleasing arc of Blue Flag, albeit shingle, beach, perfect for windswept strolling. The best places to stay in Aldeburgh offer charming views out over the sea and have a proper seaside holiday feel. Aldeburgh is close to the Royal Society for Protection of Birds sanctuary in Minsmere which is famously home to the rare bittern, among many different species. The town itself has several impressive sights, the Grade I listed Moot Hall which has been used for council meetings for over 400 years and now also houses a town museum. The Martello Tower built to resist the Napoleonic invasion. This impressive defensive outpost gives a fascinating insight of the military history of the area. Many might know Aldeburgh for the annual arts festival, the Aldeburgh Festival, which was created by the town’s most famous resident Benjamin Britten. Visitors can even visit The Red House - the house where Britten and his partner lived and composed their iconic works. It's not just a house thoug. There is a studio, historic library, gallery and beautiful gardens - ensuring there's plenty for visitors to see. The best places to say in Aldeburgh are understandably busy during the peak summer months, so get organised and book early. 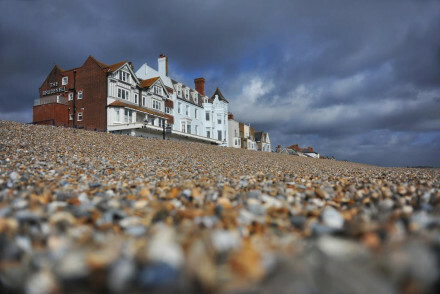 The Wentworth is a traditional seaside hotel with sea views and a terrace which fronts onto the shingle beach. There’s also a very decent restaurant and it’s a great place for families. Some of the larger rooms can be found in an annex which doesn’t benefit from the same views. If you'd prefer your own space, don't hesitate to visit our online partner Booking.com for everything from coastal cottages to rural properties - ensuring that there's something for all holiday needs. Fly to Norwich Airport located 72km (45 miles) from Aldeburgh. Despite being a small airport, there are connections to both domestic and international destinations. Alternatively, catch the train to Saxmundham train station - only about a 15 minute drive from Aldeburgh. Best time to visit - the summer months from June to early September provides the best weather for exploring or enjoying the beach, although it's also the busiest time of year. Alternatively, widen the net, and check out all our Suffolk recommendations. 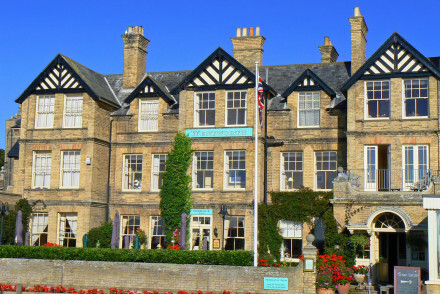 A comfortable hotel for a traditional British seaside break; good for all ages. Perfect for pottering in Aldeburgh – in summer guests will appreciate the hotel’s position at the quieter end of town – or exploring further afield from Snape Maltings to Orford. Beach Life - Situated directly on Aldeburgh's pebble beach and featuring a seafood restaurant too. Local markets - Three Suffolk Farmer's markets run throughout the month. Great walks - Take long walks along the Suffolk Coastal path. Birdwatching - Go birdwatching in the RSPB Minsmere. Traditional seaside hotel with regular fans and a timeless appeal, with seaviews and gardens and a terrace in front of a shingle beach. Comfortably unhip. Great walks - Plenty of country and beach walks. Birdwatching - Number of bird reserves close by.